Newcastle: Printed by E. Walker, for T. Bewick and Son, 1823. Second Edition. 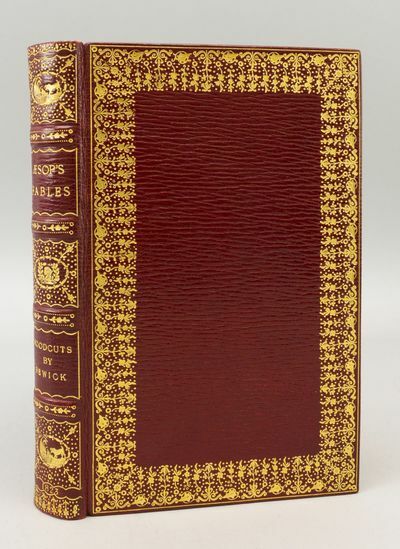 This is a beautifully bound copy of the improved second edition of one of Bewick's most charming and best-loved works. More than any contemporaneous artist or printer, Thomas Bewick (1753-1828) was responsible for a renewed interest in wood engraving, and he was particularly attracted to the illustration of fables. While still an apprentice, Bewick was set to work cutting wood blocks for books of fables by Aesop, Gay, and others. By 1812, as his memoir records, he determined that if he recovered from a severe illness, he would undertake the publication of Aesop's "Fables." He mentions that he has always admired the Aesop published by Samuel Croxall (d. 1752) in 1722, and in the present edition, all but six of the fables, culled from Aesop, Phaedrus, Gay, and others, are based on fables in Croxall. At the same time, some 21 of these fables, according to Roscoe's count, are substantially rewritten, apparently by Bewick himself. As he records in his memoir, Bewick worked during his recuperation both by daylight and candlelight at cutting his illustrations, until his eyesight suffered. Some of the work was farmed out to his son, to William Harvey, and to William Temple, and experts differ on the number of cuts done by the master himself. Roscoe writes, "I estimate there are at least 39 of Bewick's headpieces, and probably more." Our second edition appeared five years after the first, and Roscoe notes that its "most important element is the reworking of a large number of the headpieces, done in an attempt--by no means unsuccessful--to cut out the 'woolliness' and lack of definition, particularly in the skies and backgrounds, which mar so many of these cuts in the first edition." The lovely binding is more classic in style than the pictorial bindings for which Kelliegram is know, and it is beautifully executed and finished.. 218 x 135 mm. (8 1/2 x 5 1/4"). xxiv, 376 pp. Second Edition. SUMPTUOUS SCARLET STRAIGHT-GRAIN MOROCCO, GILT, BY KELLIEGRAM (stamp-signed on rear pastedown), covers with lovely dentelle frames, spine gilt in stippled compartments with oval centerpiece featuring either a hunting dog or a lamb, gilt titling, densely gilt turn-ins, lavender endpapers, all edges gilt. In a (somewhat worn) fleece-lined red cloth folding box. Wood-engraved vignette on title page, 191 VIGNETTE HEADPIECES, one for each Fable and for three preliminary sections, most of these also with vignette tailpieces, all designed by Thomas Bewick. Wood-engraved receipt from Bewick dated January 1, 1824, with moonlight landscape vignette, red-printed leafy branches, and Bewick's thumbprint mark, bound in at front. Ray 53; Roscoe 46b. A breath of rubbing to extremitites, perhaps a dozen leaves lightly age-toned, other trivial imperfections, otherwise AN ESPECIALLY FINE COPY, clean and fresh IN A SPARKLING BINDING. This is a beautifully bound copy of the improved second edition of one of Bewick's most charming and best-loved works. More than any contemporaneous artist or printer, Thomas Bewick (1753-1828) was responsible for a renewed interest in wood engraving, and he was particularly attracted to the illustration of fables. While still an apprentice, Bewick was set to work cutting wood blocks for books of fables by Aesop, Gay, and others. By 1812, as his memoir records, he determined that if he recovered from a severe illness, he would undertake the publication of Aesop's "Fables." He mentions that he has always admired the Aesop published by Samuel Croxall (d. 1752) in 1722, and in the present edition, all but six of the fables, culled from Aesop, Phaedrus, Gay, and others, are based on fables in Croxall. At the same time, some 21 of these fables, according to Roscoe's count, are substantially rewritten, apparently by Bewick himself. As he records in his memoir, Bewick worked during his recuperation both by daylight and candlelight at cutting his illustrations, until his eyesight suffered. Some of the work was farmed out to his son, to William Harvey, and to William Temple, and experts differ on the number of cuts done by the master himself. Roscoe writes, "I estimate there are at least 39 of Bewick's headpieces, and probably more." Our second edition appeared five years after the first, and Roscoe notes that its "most important element is the reworking of a large number of the headpieces, done in an attempt--by no means unsuccessful--to cut out the 'woolliness' and lack of definition, particularly in the skies and backgrounds, which mar so many of these cuts in the first edition." The lovely binding is more classic in style than the pictorial bindings for which Kelliegram is know, and it is beautifully executed and finished.